When I started my career in social media and community management, I was a bit intimidated and nervous. Things were changing quickly and I was trying to absorb everything I could read and learn from really smart folks. One of my former bosses suggested that I check out the Community Roundtable – that was 2008 – and I was happy to check out the information that Jim Storer and Rachel Happe were producing. Little did I know that less than two years later I would sign up for the Community Roundtable and now consider both of them good friends. So when I received a message in the CR Network to be a member of the advisory committee for the 2013 State of Community Management report, I was happy to help out. After all it was the earlier reports that helped steer my visions so I figured it would be a great experience. 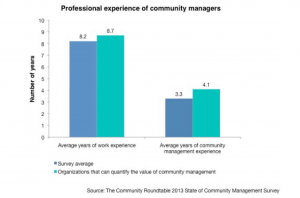 I was happy to chat with some really smart folks and peep out some really cool data on community management. Appreciate the recap Jeff, thanks.